One morning just a few days before we were to return to Puerto Rico, Nicodemus and I woke up and prepared for what I thought was going to be a couple hour trip and overnight stay to see some land that he, his wife, Richard, Naomi and a few others had pulled together to rent and were having plowed. 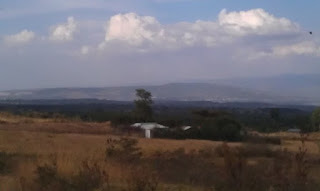 A few hours turned into most of the day as we traversed along the sporadic path to Nakuru. We would ride on one bus or van that would be packed full of passengers to the next. On several occasions along the trip we would need to exit one vehicle and walk a mile or two before we could get to the next location to catch one that was also going our way. The further we got away from Nairobi and closure to Nakuru the harder it became to find transportation and the more crowded the vans would become. I decided at one point to count the passengers in the van I was in. I was up to 22 in my count when I was asked to get out of the van and move to the front seat. The man responsible for filling the van realized he could get more people in the back if I was moved to the front. Another 2 people were added to the already overcrowded van that was never intended to carry more than 10 passengers. Many of the passengers, like myself, had brought along a backpack or small suitcase for whatever journey still lied ahead of them. We did eventually make it to the place we were to stay for the night and were relieved to have a place to leave our things. The journey was not over, we still needed to make it to the fields. We walked out to a place where people were gathering but no one was headed where we were headed this time, or were already overloaded. Taking a taxi was not going to be very likely. As soon as the driver would see me the price would double. Eventually Nicodemus walked far enough away that I was out of sight and could negotiate a fair for us to travel to the fields, which I soon learned were at the bottom of the Great Rift Valley. When we did meet up with the man who was plowing the land and I saw what this “garden” looked like I was reminded of the passage of the people who traveled out to the wilderness to see John the Baptist and were told, "What was it you came to see?". What I saw was a step of faith unlike any I had seen before. This garden was not one field it was 3 and covers 18 archers of land. As Nicodemus met with the man over the plowing of each of the 3 fields the scope of what they had set out to do had dawned on me. They were not preparing food for the children to eat for the coming year, they were preparing for a way to provide food for the children that would sustain them for many years to come. Keeping 200 children fed each day is more than an obstacle, each day they get fed is nothing short of a miracle. For several years we have sent money that comes into our ministry that has been designated for feeding the children. Sometimes it is less and sometimes more. We normally send $65 each month to help the children with food. With last year’s famine coupled with a struggling economy where the money does not go as far as it did, the money we send is only enough to buy a week’s worth of food. The money helps but will not sustain them. The struggle to keep all of these children fed is not a small matter for those who are carring for them. 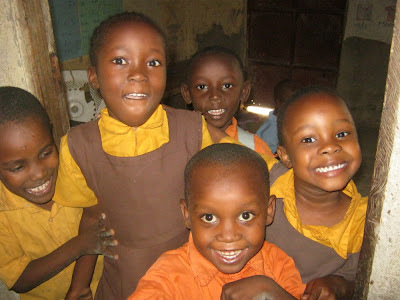 They have all made significant sacrifices to provide for these children. 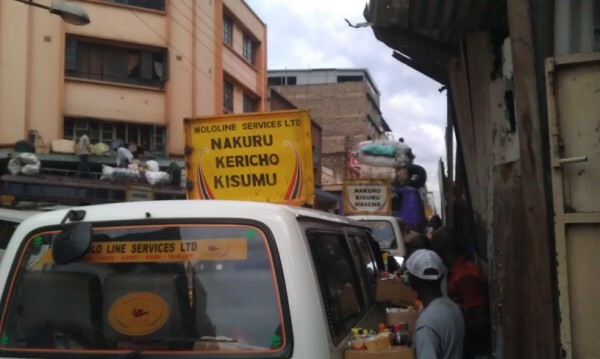 Richard travels to Mombasa for work, Naomi has taken a job as s teacher for the Kenyan government, and Nicodemus spends months away from his family traveling from one part of Kenya to another trying to get enough to feed the children for that week. These fields represent an opportunity for the struggle to feed all of these children to be fed to be lifted, not just for one season but for all of them. 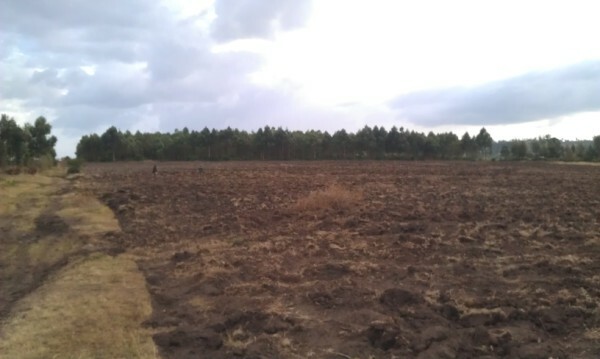 Collectively they collected $800 to rent the fields and till the land. It will take another $800 to buy seed and fertilizer to plant a harvest of corn and beans, the two main foods they use to feed the children. They are planting more than enough to feed the children for the year. With the remaining crop they will sell what they do not use for the school so that they can be in a position to plant next year’s harvest, and the next, and the next. 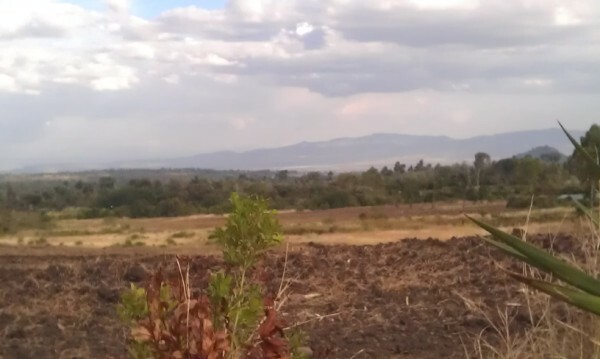 There is no doubt in my mind that they will get the remaining amount of funds they need to plant these crops. I know that God will bless their trust and faith in Him. The only question is how will He go about it? What about you? 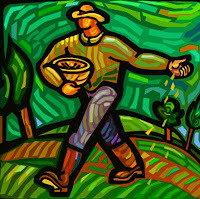 Are you sowing the seeds God has given you? Now normally we do not think of this passage with real seeds in mind but this time you have an opportunity to sow seeds of faith that will produce a real harvest, that will fill the bellies of real children who will offer praises that will overflow into many thanksgiving to God who will in turn give you even more seeds to sow. 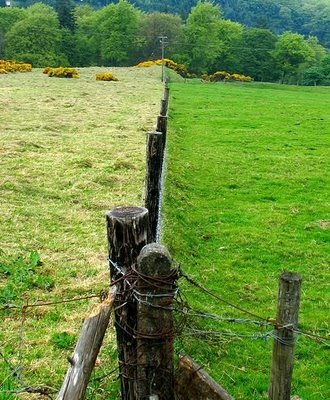 This time the grass IS greener! When one thinks of a country in Africa, you think: poverty, disease, famine, starvation and just over all unclean living conditions. In some places of Africa this is certainly true but as Americans all too often we fail to see beyond their physical circumstances and we miss out on what their true circumstances are. What could be more important than the physical circumstances, you ask? If you don’t know where your next meal will come from, out of a job and you might be evicted from your house for lack of rent money, what else would take precedent?! 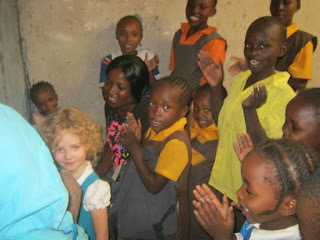 This month I was once again amazed by the children and just in general, the people here in Kenya. I was blessed to prepare VBS material for Kayole and Kisii. I took part in aiding the teacher in Kayole but was unable to take part in the classes for Kisii. I had wanted to test and see what the spiritual knowledge of the children (ages 5-15) here in our school in Kayole and was completely blown away. For some reason I automatically used my knowledge of what American children know and their ability to grasp spiritual things as a barometer when preparing lessons for the Kenyan children. And once again I stood corrected. From day 1 the children exhibited a solid foundation in not just biblical knowledge but also an understanding of how to use apologetics in order to expand their understanding. When they did have questions they were insightful and thought provoking. 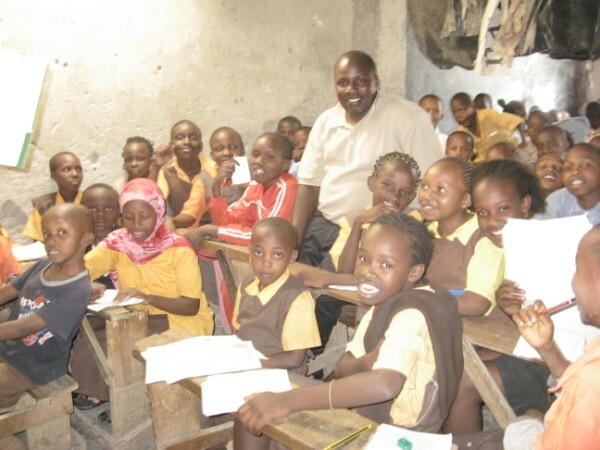 Children in Kenyan have the ability to learn and adapt by simply being content with their surroundings. They find their fullfillness in community and their love for God and each other. Their need for entertainment and the latest gadgets is non-existent. There were over 80 children packed shoulder to shoulder in a small, 1 window class room, after school hours just to hear and learn about the Bible. There were no exciting dramas, no silly video with catchy phrasing to help them learn verses, no props on a stage or puppet time. There was simply a building, benches for seating and a hunger for the Living Water. Wow, how refreshing it was to be there in their midst! When it came time for the salvation invitation I was quite confident there would be none. We announced that after class if they wanted to make a personal decision on how to accept, believe and confess in the Lord, that they should stay behind. There were 27 who stayed. One by one each child stood up and prayed either out loud or silently and in their native tongue, to accept Christ as their Lord and Savior. Two children who were present decided they were not ready to pray and so as a class we all laid hands on them and prayed for the seeds that were planted in their hearts that week. 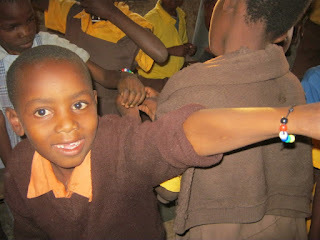 The week was wrapped up by every child making the Power Band bracelets. They learned about sharing the Gospel and the Scripture for each color bead in their bracelet. Needless to say they were very enthusiastic. 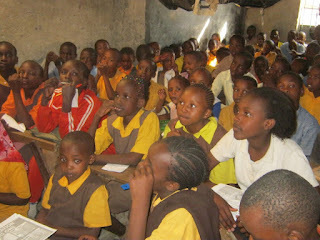 I look forward to hearing the results from the VBS classes in Kisii. We will be sharing the information as it is relayed to us by the leaders there. As I reflect upon our time here, I come away with many thoughts and lasting impressions. Most of them being along the lines of desiring to see Americans realize we can learn many things from the Christians here in Kenya when it comes down to what it means to truly follow God and care for one another!